The IGH team attended a showing of The Voyage of the Dawn Treader and as the resident Narnia zealot, I was super excited and super worried. I prefer it when the film doesn't take too many liberties and stays as true to the story as they can. I have to say, even though changes were made, I was not disappointed. First off, all of the original actors made it back, which is fantastic. Really helped keep the spirit of the first two movies. All four Pevensie children make an appearance in the movie which is done in a wonderful way. It really blends well with the story, despite being a new addition. The biggest and newest part of this movie is Eustace, the nasty cousin, who gets pulled into Narnia with Edmund and Lucy. 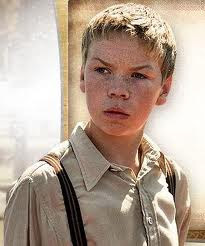 Eustace is played by the adorable Will Poulter and I have to love his performance. He brings a good amount of self-importance and snobbery to the role. I only wish that they used him more. He was a dragon for way too long. In the story, Aslan turns him back much sooner and we can see how he has changed into a nicer person. They really should have given him some more chances to capture the audiences hearts if they are going to make The Silver Chair. The introduction of a new plot point with the swords was an interesting one that was probably added to make this more of an action story and hide some of the religious undertones. I still prefer the original story, but this helped keep the attention of the movie goers. The other big change was the order of stops. The switched order of events did throw me during the movie but it still conveyed the message, just in a different order. The effects were decent. They did their job but didn't blow me away. One scene I liked was when the three kids enter the painting at the beginning of the film. The way the room filled with water and then turned into an ocean was fantastic. I also loved the scenery, which I feel has been a strong point in all of the films. 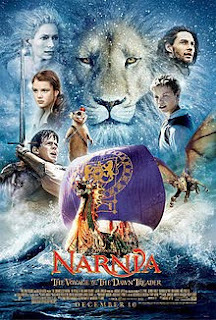 They bring a continuity to the films with the Narnian designs. The attention to detail is seen in every inch of the film, from the masthead of The Dawn Treader to the designs in the Magician's library to the setup of Ramandu's table. This is a visually pleasing set and really incorporates a feeling of riches and magic. This is why I am glad I saw it in 2D and not 3D. With 3D, it is harder to see everything and take it in. The visuals in these films really make the movie and you lose some of that in 3D. Sometimes, 2D is better. All in all, I liked it. It still tells a good story about the human spirit and there are talking animals! Kids will like it (but might get scared in the last big battle) and parents won't get too bored. For Narnia and For Aslan!! !